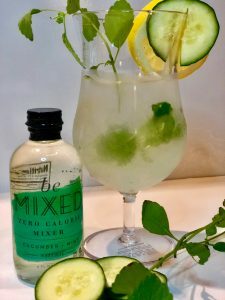 I love all things minty and cucumber so I am excited to share with you a new all-natural, zero calorie, sugar-free mixer. 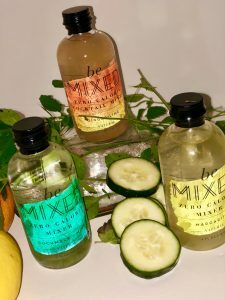 Be Mixed uses monk fruit and stevia for sweetness. Besides being all-natural and sugar-free, it has no artificial flavors or preservatives, and it’s gluten and dairy free. For this Sugar-free Minty Cucumber Spritzer, I quickly muddled some fresh mint from my herb garden. This optional step is more for the presentation than the taste- but fresh mint is always a plus! Mint is a calming and soothing herb that has been used for thousands of years to aid with upset stomach or indigestion. It’s one of the easiest herbs to grow. You can purchase a small plant at your local grocery store for a couple of dollars, then be prepared for a large harvest! It grows quickly. It’s really nice to have on hand in your garden. Put the mint in a small sturdy glass or jar. Add a little water with the mint. Choose a gentle muddling tool. A small, flat wooden tool is ideal. I have one from Williams Sonoma that I love! You could also use the end of a wooden spoon. Make sure to use a gentle hand with the mint, and avoid using a muddling tool with teeth as this will tear the leaves too much. Press and twist lightly. Mint, basil, and other soft leaves release bitter flavors when crushed or torn apart. Just press down gently with the blunt tool while you twist, then release. Do this two or three times. Add for presentation. You should be able to smell the mint as the flavorful, aromatic oils are released. Add the mint to a cocktail glass for a pretty presentation and added flavor. Enjoy! My sweet friend brought this Be Mixed Mixer over on a late summer Saturday evening. In the south, at some point when entertaining, you end up on a porch outside, no matter how hot it is. This drink is twice as good when paired with friends and fellowship. 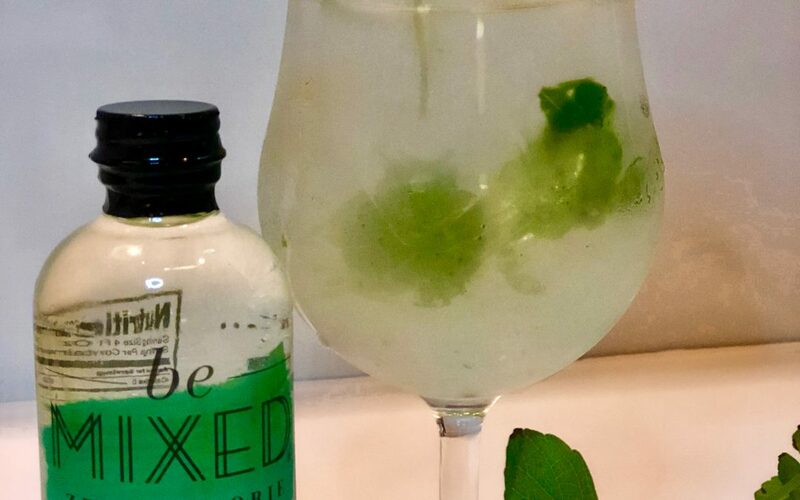 This is another delicious “healthier” Mojito recipe- https://www.thefitsoul.com/sparkling-summer-probiotic-mojito/. 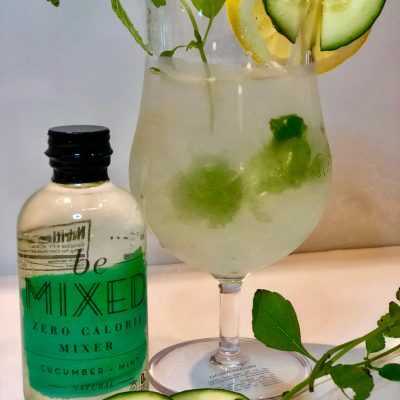 Enjoy this Sugar-Free Minty Cucumber Spritzer! Not only is it delicous and easy to make, it's beautiful! Put the mint in a small sturdy glass or jar. Add your fresh mint to a sturdy jar or glass with a little bit of water. Choose a gentle muddling tool. A small, flat wooden tool is ideal. I have one from Williams Sonoma that I love! You could also use the end of a wooden spoon. Make sure you use a gentle hand with the mint. Avoid using a muddling tool with teeth as this will tear the leaves too much. Add for presentation. You should be able to smell the mint the flavorful, aromatic oils as they're released. Add the mint to your cocktail glass for a pretty presentation and added flavor!